SINGAPORE - Engineering firm China State Construction Engineering Corporation has clinched the contract for the construction of the Cantonment MRT station for $205 million, the Land Transport Authority (LTA) announced on Friday (Nov 10). Construction of the three-level underground station in Keppel Road - part of the sixth stage of the Circle Line (CCL) - will start by the end of this year and end in 2025. The winning firm completed the construction of the Kaki Bukit and Geylang Bahru stations on Downtown Line 3 recently, and is also working on the design and construction of the upcoming Canberra station on the North-South Line. The station is expected to open in 2019. The firm is also in a joint venture with Nishimatsu Construction to construct Keppel station and its tunnels on CCL6. 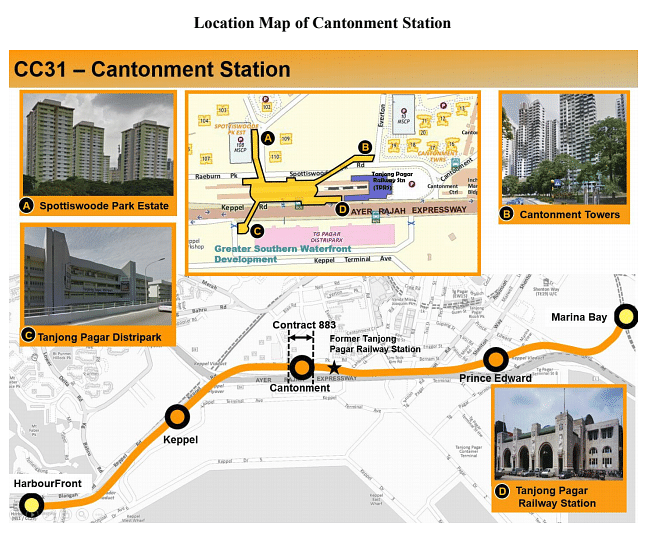 When completed in 2025, the 4km-long CCL6 will have three stations - Keppel, Cantonment and Prince Edward - and will connect HarbourFront and Marina Bay stations, closing the loop for the Circle Line.